Back then, hikers considered trekking poles as nothing more than an accessory. However, as the hobby became popular and more people are willing to try more challenging hiking tasks, trekking poles are now a considered a standard equipment. 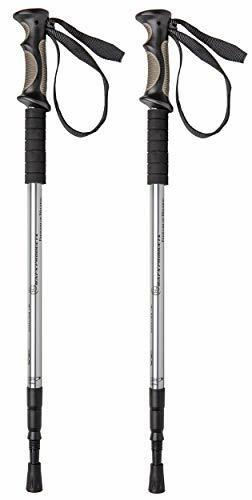 At first glance, there doesn’t seem to be a lot going for trekking poles; to the average joe, they’re nothing more than a couple of “walking sticks”. However, the extra balance and support they provide play a key role in trekking on most kinds of terrain. You may think that any pair of trekking pole is good enough, but some of them are way better than others. This is why we’ve come up with a guide to help you find the best trekking poles you can buy online. The main thing that separates the best trekking poles from ordinary ones is versatility. Sure, you can bring any pair of poles during your net trek, but how useful or convenient they will be if they’re too bulky, heavy, or awkward to use? To find the best options, you have to check out multiple trekking pole reviews and know what makes the best a notch above the rest. Picture this, you’re treading on a steep slope and you need your trekking poles to get up there. Unfortunately, your poles are too long, and you end up struggling just to make sure they’re properly positioned. Instead of helping you climb up, your trekking poles are actually holding you back. The same thing can be said when you’re descending on a steep incline. If your trekking poles are too short, you’ll find yourself having to lean forward just to position your poles, and we all know how dangerous that can be when you’re on uneven terrain. Instead of carrying another pair of shorter trekking poles you can use adjustable trekking poles so you can have the ideal pole length for tackling all sorts of terrain. Different trekking poles have different adjustment mechanisms, but veteran hikers like Ian Nicholson from Outdoor Gear Lab says lever lock poles are more durable and easier to use. Hiking has become a popular hobby, but many people are still frustrated knowing that they don’t have the strength or physical capability to try it out. Fortunately, trekking poles may be the answer to their problems, thanks to the availability of shock-absorbing poles. Shock-absorbing poles feature internal springs near the tip of their shafts. This greatly reduces the shock when positioning the poles on the ground and when putting pressure on them. This is great for people with weak joints that could’ve kept them from enjoying hiking. Some hikers claim that shock absorbers are unnecessary. 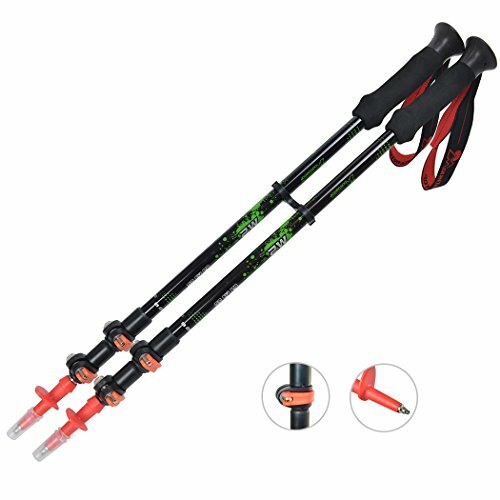 According to an article on Slackpacker.com, shock absorbing trekking poles can increase fatigue. Fortunately, you can turn off the feature on most trekking poles today, so it’s not really an issue, and you still get the option to turn it on in case you need to. Since hiking takes a lot of energy, you have to efficient at spending it. Any kind of luggage may not seem like much, but you’ll find that every pound you carry on your treks matters, especially on extended hiking trips. The best trekking poles are usually made of either aluminum or carbon. This makes them extremely light, but still durable enough to provide the necessary support. Hiking blogger Andy Howell says carbon poles can get brittle during cold conditions, but newer poles use a combination of aluminum and carbon to address this problem. Hikers who don’t need a lot of support can also go for ultralight trekking poles, which are thinner and easier to carry although not as rigid as standard poles. Take note that you should always consider the type of terrain and your overall experience when going for ultralight options. Because the best trekking poles for backpacking are all about options, you should go for poles that have the necessary features. Trekking poles don’t need to have all the bells and whistles, but if you know what each feature does, you’ll have an easier time looking for something that suits your personal needs. For example, you can go for trekking poles that have adjustable wrist straps and cushions to improve comfort and prevent your arm from chafing. This may not seem like much but the last thing you’d want when you’re out there are sore arms rubbed raw from all that friction. Some features also improve the poles’ performance. Pole baskets will keep the pole tips from getting stuck into snow or soft ground while choosing the right pole tips will help improve overall traction. Outdoorplaces.com recommends chiseled-out tips, which work on most kinds of surfaces. Are you ready to look for the right trekking poles for your next trek? You can start your search by checking out a list of highly-recommended poles that you can buy online! Whether you’re new to hiking or have been in the hobby for years, you can’t go wrong with Alpine Summit Trekking Poles. The aluminum poles weigh just 8.5 ounces each but are more than capable of providing all the support and balance you will need even in the most challenging terrain. The lever-lock telescopic poles allow easy adjustments to suit your exact height and reach; changing pole lengths can be done in seconds. Furthermore, the tungsten tips and multiple basket options will give you all the traction you need without getting you stuck in muddy or snowy terrain. Ergonomics play a key role in making the Alpine Summit Poles a solid option. With it’s easy to grab cork handles and adjustable hand straps, you don’t have to worry about losing grip because of sweaty hands.These features also help reduce the strain on your wrists during extended treks. Great all-around trekking poles for different kinds of hiking. Comfortable to use even during extended treks. Some hikers claim that the weakest point (if any) seem to be the locking mechanism. If you’re looking for something that’s more appropriate for entry-level hiking, then BAFX poles should be one of the first things in your list of options since it’s one of the top rated trekking poles. Its aluminum frame provides all the rigidity you’ll need for managing decent inclines, and the steel tips and rubber footing should be more than enough for basic treks. BAFX poles feature plastic handles which are excellent when it comes to durability. However, you may want to switch to something easier to grip if you’re planning on extended treks, since the hard plastic can get uncomfortable over time. There is some foam in the part right below the handle for easier carrying when not in use, but one could wonder why they didn’t just put the same material on the handles themselves. While BAFX poles may not be a premier option for more serious treks, you’re already getting a lot of value for such a low price tag. This makes BAFX Trekking poles a great pick if you’re just trying out hiking and you don’t want to fully invest in the hobby yet. Excellent value for its price, cheap and easy to replace. Helps you get used to the use of trekking poles. Plastic handles can be uncomfortable after some time. Locking mechanism can be awkward to use. The first carbon fiber poles in this list, the Cascade Mountain Tech poles weigh in at only 8 ounces each. You’d think something that lightweight would easily get damaged if used for something beyond casual hiking, but some hikers claim the poles are tough enough for high altitude, extended backpacking trips! Although the locks don’t look as good as those on high-end trekking poles, they are very reliable and are not likely to slip. Some readjustments after heavy use should and the Cascade Mountain Tech poles are already good to go. Last but not least, the Cascade Mountain Tech Poles are very comfortable to use. Extended grips leave plenty of room for your hand to move around, and the foam padding is a lot better than hard plastic or rubber. Overall, a great option, considering its low price tag. Good quality carbon poles for a low price. Extended grip greatly helps on steep climbs. Lightweight but strong enough for extended treks. Locking mechanisms are good, but could there’s still room for improvement. While High Trek poles cost a bit more than the BAFX poles, they are a bit lighter and feature carbide tips instead of metal. Other than that, they both feature rotational locks, plastic handles, and have very similar extension ranges. 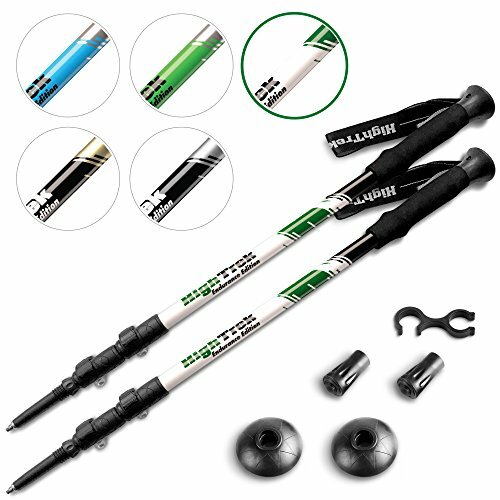 If you want something lighter than the BAFX poles at a similar price, the High Trek Trekking poles will serve as a nice alternative. The quick locks are easy to use so adjustments can be done on the fly, and there’s a measured section in the middle part of the shaft to help make adjustments even faster. While the High Trek Trekking poles are more suitable for moderate hiking unlike the BAFX poles, it’s still better to go for something more rugged. Nevertheless, the High Trek Trekking poles share its spot with the BAFX as the best trekking poles in their own price category. Slightly tougher than BAFX; can be used for moderate hiking. Easy to use quick lock. Cheap but great value given the price. Isn’t an ideal option for longer trips or tougher terrain. 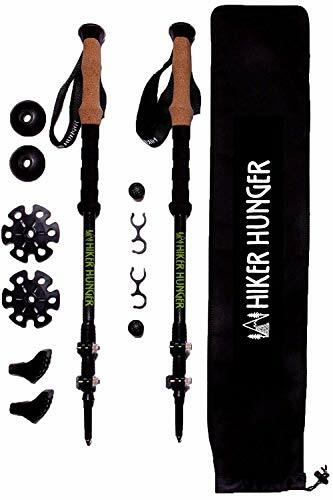 Hiker Hunger Trekking Poles are some of the most highly recommended poles available and for good reason; these poles are made of 100% carbon fiber, making it one of the strongest AND lightest poles you’ll ever find online. Aside from their weight advantage over other options, Hiker Hunger Poles also feature tungsten carbide tips, which are super tough and capable of providing traction even on hard terrain. If you don’t like the carbide tips, you can always switch them with rubber tips and rubber feet, which are included in the package. For extra comfort and a secure grip, Hiker Hunger Trekking poles also feature non-slip EVA foam grip extensions and cork handles that helps reduce sweating on the hands. Because of its weight, durability, and versatility, Hiker Hunger Carbon poles deserve to be considered one of the best lightweight trekking poles available today. Scores high marks on weight, durability, and ergonomics. Can be used in almost any kind of hiking. Incredibly versatile – has a very wide adjustment range. Carbon is more brittle than aluminum. 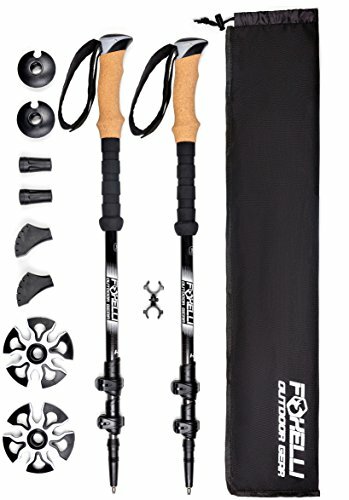 If there wasn’t any branding on the poles, you’d easily mistake Foxelli trekking poles with the Hiker Hunger trekking poles. They look almost exactly the same, and both are made of 100% lightweight carbon fiber so you can expect roughly the same weight and durability. It also has the same features that make the Hiker Hunger poles: quick lock technology, cork grips, and even the EVA foam grip. With near similar performance, it’s no wonder why Foxelli Trekking poles have become one of the most popular trekking poles online. 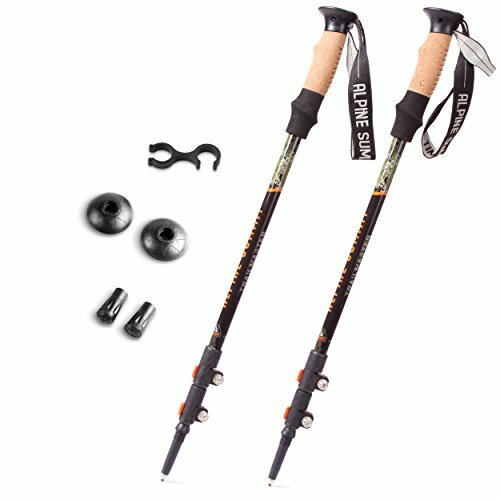 Nearly the same price AND performance as the Hiker Hunger carbon poles. Could be a good alternative in case Hiker Hunger poles are out of stock. Perhaps a bit too much like the Hiker Hunger poles? Quick adjust turn-locking system, lightweight alloy material, and low price? We’re looking at a serious contender here for the BAFX poles. The main difference is that Mountaintop Trekking poles have EVA grips compared to the rubber grips on the AFX. Unlike the BAFX, Mountaintop Trekking poles do not come with extra rubber tips. The strap offers decent wrist support, and adjustable bolts on the lever allow more specific adjustments to adapt to most hiking situations. A good alternative to the BAFX poles. EVA grip helps keep grips free from sweat. The same as BAFX, you can easily replace it with a high-end pole for more serious hiking trips. That wraps up this start list of the best trekking poles. Do you think you found the right trekking pole for you? Are you going for one of the cheaper starting poles or go straight for a more expensive one? Deuter vs Osprey Backpack Comparison – Which One is Better? The Debate Ends Here! ENO Hammock Review – Is It The Best Camping Hammock 2019?